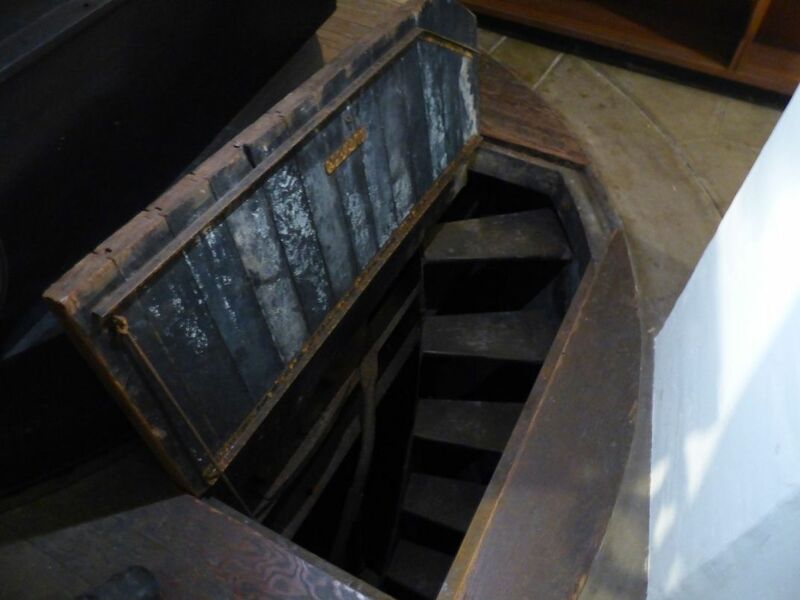 Three stories beneath the telescope dome at the Hale Solar Laboratory in Pasadena, California, a rusty spiral staircase marks the top of a nearly 80-foot-deep pit, concealed by a wooden trapdoor in the basement floor. At the bottom lies a grating meant to split light into a rainbow to allow scientists to study the makeup of the sun. The building’s current owners dare not descend, deterred by the lack of oxygen and impenetrable darkness below. When architects Liz Moule and Stefanos Polyzoides bought the observatory in 2006, they knew they were purchasing a piece of history. The original owner, astronomer George Ellery Hale, established the world’s most powerful telescopes in the first half of the 20th century, including at Mount Wilson Observatory, high above Pasadena. Moule, who runs a local architecture firm with Polyzoides, regards Hale as “a model citizen” for his influence on Pasadena’s cultural landscape and civic architecture. 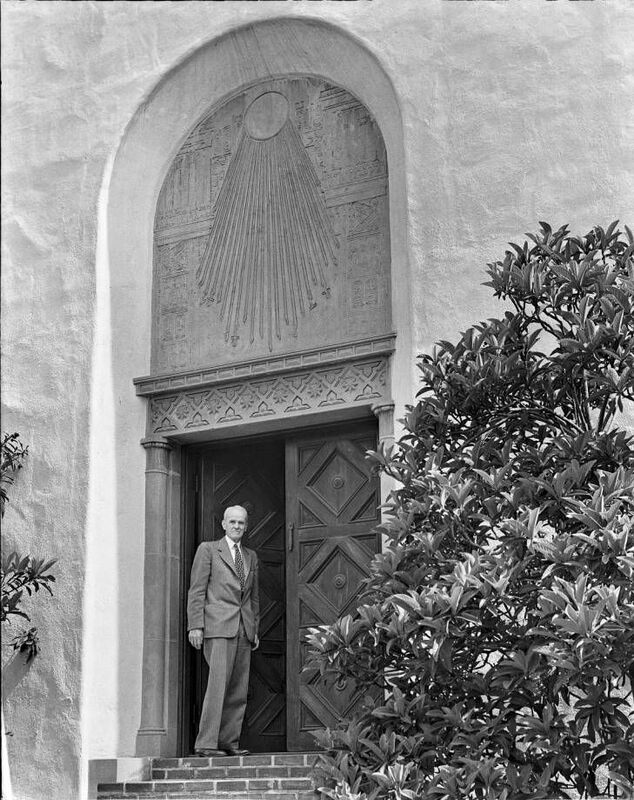 The Hale Solar Laboratory, with its Egyptian-style relief of the sun beaming down over the front door, grand library on the first floor, telescope dome on the roof and ominous pit in the basement, was Hale’s private refuge just a few blocks south of the university he helped found, the California Institute of Technology. Moule and Polyzoides had no idea the building, constructed in 1924, came with hidden astronomical treasures. The whole basement was a cluttered mess of furniture, papers and boxes of junk when they purchased the historic facility (along with the more modern stucco home in front of it). “We thought we were left with stuff we were just going to get rid of,” Moule says. In the observatory basement, Moule and volunteers from Mount Wilson—Don Nicholson and Larry Webster—discovered hundreds of glass photographic plates from the 1880s to 1930s stacked in boxes in a large wooden cabinet. The collection includes images of sunspots and solar prominences—tendrils of plasma that snake out from the sun—and solar spectra, or series of lines that represent components of light, revealing the sun’s chemical composition. Larger plates depict the cratered moon, edged with ripples from basement water damage. Some of the plates are from Hale’s telescopes, while others were clearly gifts from far-flung astronomers. All told, there were more than 1,100 plates and other artifacts from Hale’s private collection hidden in the Solar Laboratory’s basement, says Dan Kohne, who volunteered with the nearby Carnegie Observatories’ Pasadena office to inventory the find. Polyzoides and Mules donated the historic plates to the Carnegie archives. 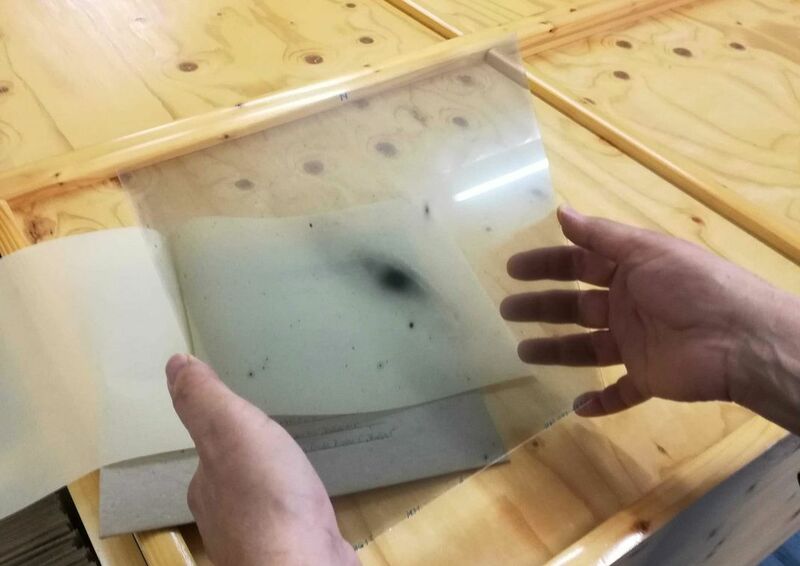 These photographic plates represent the painstaking way astronomers used to work, hand-positioning a telescope on an object for long enough to capture it on a glass plate coated with emulsion, then developing the plate like film in a darkroom. The first daguerreotype photograph of a star other than the sun was taken in 1850 by William Cranch Bond , the first director of Harvard College Observatory, who made a 90-second exposure of Vega. 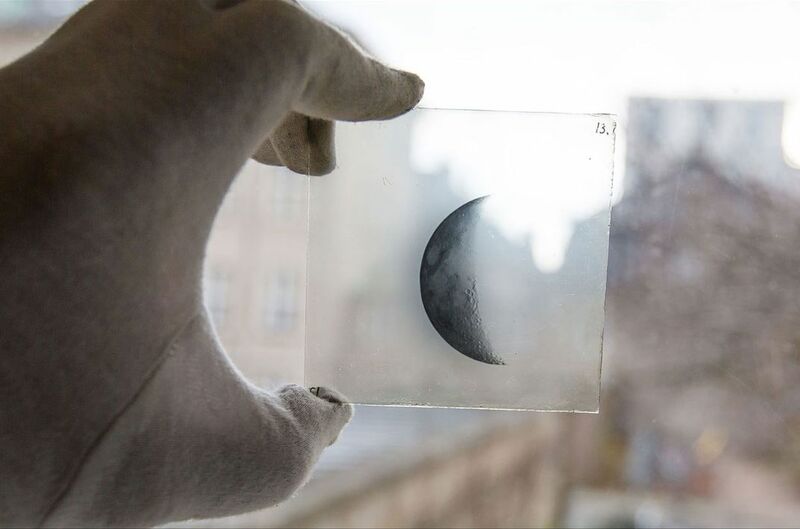 For the next 150 years or so, scientists catalogued the universe on these glass plates, about as thick as a window pane. While technological advances in photography, telescope guidance and computing have largely made plate-based skywatching obsolete, studying glass plates was how astronomers reached historic revelations, such as the existence of galaxies beyond the Milky Way and the fact that the very fabric of the universe is expanding in all directions. Historic plates aren’t just relics. They represent a record of the sky at particular moments in the past that can never be revisited—not even with the most powerful space observatories. Today, humanity’s most advanced telescopes can reveal distant objects that periodically brighten, dim and pop in and out of view. The European Space Agency’s (ESA) Gaia space telescope , for example, is compiling the most complete star maps yet. Some of the objects going through changes right now could have also varied in the late 19th and early-to-mid 20th centuries, and they may have been captured on glass telescope plates. As astronomers seek to tell more complete stories of how celestial objects evolve over time, these dusty old plates may prove all the more relevant. By some estimates there are more than 2 million glass plates made by professional astronomers in the U.S. alone. Worldwide there are likely more than 10 million, says Rene Hudec of the Academy of Sciences of the Czech Republic in Ondrejov, including many that may still be hiding in unexpected places. While there is an online database of over 2.5 million plates from more than 570 archives, there is no truly comprehensive list. Having visited more than 70 plate archives himself, Hudec reports some repositories are well kept and cataloged, but others are a “sad experience” with little funding and no one to manage them. Hale’s collection from the Solar Laboratory basement joined more than 200,000 plates housed by Carnegie Observatories, including the 1923 “VAR!” plate , which convinced Edwin Hubble that Andromeda is a separate galaxy from the Milky Way. The Yerkes 40-inch telescope, the Mount Wilson 60-inch, the Mount Wilson 100-inch and the Palomar 200-inch, all Hale’s projects, have each taken turns enjoying the title of “world’s largest telescope.” Their results are stored in drawers behind a short black vault door in the basement of Carnegie Observatories’ main office building in Pasadena. In 2015, Holger Peterson stumbled upon boxes containing about 300 plates when he went to the basement to make tea at the Niels Bohr Institute in Copenhagen. 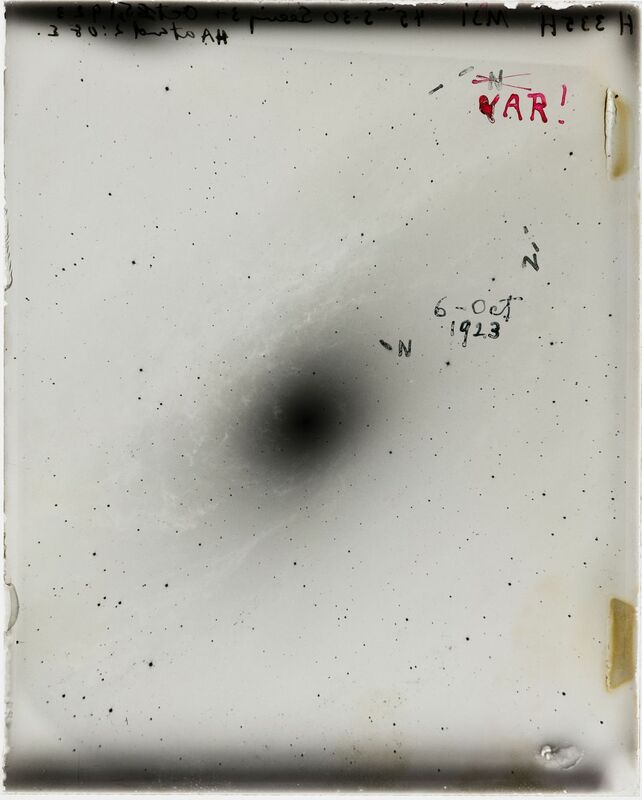 Some of the artifacts were clearly identifiable: a 1950 exposure from the Palomar Samuel Oschin Telescope showing a large number of galaxies, and a copy-plate from the 1919 solar eclipse expedition to Sobral, Brazil, that helped confirm Einstein’s theory of general relativity. (Einstein predicted that the sun’s gravity should bend the fabric of space around it, so the positions of background stars would shift from our perspective when the moon blocks the sun during a total solar eclipse. Measurements on glass plates were used to confirm this.) But for many plates in this collection, now located at Copenhagen University, the details of the exposures have been lost, Peterson says in an e-mail. Also in Europe, the Archives of Photographic Plates for Astronomical USE (APPLAUSE) currently comprises about 85,000 plates from five institutes in Germany and Estonia. Highlights include plates from Ejnar Hertzsprung, who helped show the relationship between stellar temperature and intrinsic brightness, and Karl Schwarzschild, who was instrumental in developing mathematical descriptions of black holes. In Argentina, the plate archive at Cordoba Observatory houses some of the first photographs of stars in the Southern Hemisphere with about 20,000 photographs and spectra on plates dating from 1893 to 1983. The plate situations in Asia and Africa have not been as thoroughly researched. Hudec has visited various locations in China with plates and estimates some 40,000 have been both collected and digitized. Bosscha Observatory in Indonesia additionally has about 20,000 plates, he says. About 19,000 plates taken at the UK Schmidt telescope in Australia are stored in Edinburgh, Scotland, says David Mallin, a photographic scientist at the Anglo-Australian Observatory. The Anglo-Australian Telescope in Siding Spring retains under 3,000 plates that were taken there, while other plates likely remain with observers who never handed them over to the observatory collections. 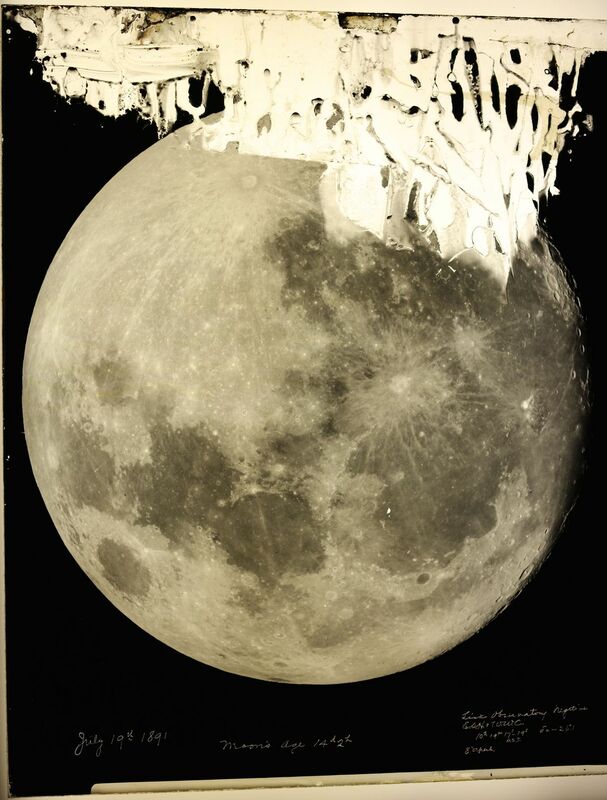 As of the early 1990s, professional astronomers abandoned the practice of capturing celestial images on glass in favor of using digital methods that are both quicker and allow for more sophisticated computational analysis. The invention of charged coupling devices (CCD), which also enable smart phone cameras, has revolutionized astronomical observations. Techniques as simple as “zooming in” digitally and heightening contrast on a computer are powerful tools for studying distant, faint objects. But historical records of the sky have multiple layers of value. As a matter of cultural preservation, telescope plates encapsulate the process by which knowledge was once acquired and represent the state of science when they were used. For roughly 150 years but no longer, astronomy data was recorded on glass. “Knowing about the precursors is in many ways something which even informs how we do astronomy now, so we shouldn’t forget,” says Harry Ecke of the Leibniz Institute for Astrophysics Potsdam in Germany, one of the leaders of the APPLAUSE collaboration. Astronomers can even use historical records to make discoveries today. While many cosmic processes take billions of years to evolve, “transient” objects in the sky, such as exploding stars called supernovae, change markedly over periods of weeks to years. Variable stars brighten and dim periodically, and plates can be used to determine if that period is constant or not. In 2016 , one astronomer even used the Carnegie archive to point out evidence for exoplanets in a 1917 stellar spectrum , a plate made some 75 years before anyone would discover planets beyond our solar system. The study of black holes is one reason Jonathan Grindlay at Harvard got interested in digitizing old plates. He is the principal investigator of a massive plate-digitizing effort called DASCH, the Digital Access to a Sky Century @ Harvard. When a sun-like star and a “stellar mass” black hole—typically seven times the mass of the sun—orbit a common center of gravity, the star provides a steady stream of matter ripped away by the black hole. But instead of falling directly into the black hole, the material piles up in an accretion disk around the black hole first. After about 30 to 60 years, the disk becomes unstable and the black hole devours some of the accumulated material, resulting in a very bright outburst in optical and X-ray light. DASCH provides the first full-sky record of more than a century of these rare outbursts, allowing scientist to measure how long they are visible and how many flashes occur across the sky. Many more telescope plates exist in the world than there are digital versions of them, and financial support for digitization and detailed cataloging is limited. A group of Czech astronomers led by Hudec visited Carnegie, PARI, Yerkes, Lick, Mount Palomar and nine other major U.S. locations from 2008 to 2012 to scope out the historical plate offerings. They found that some archives had not properly stored or had even damaged plates. They tested out a transportable scanning device and recommend that institutions scan and catalog their treasures. So far, Hudec’s group has created about 50,000 plate scans across the world. DASCH has been able to digitize about 350,000 of Harvard’s plates, which are all searchable online , and plans to get to the total of 450,000 photographs by October 2020. The last 100,000 plates are stellar spectra which, while also interesting, are not being scanned because only the direct images can show visual changes in brightness over time. The whole process of cleaning and scanning is “like a choreographed ballet,” Grindlay says. In Europe, APPLAUSE is also digitizing its plates, taking inspiration from DASCH in some of its methods but using commercial scanners instead of custom-made devices. The digitization enterprise stirred up controversy when some historians balked at the idea that original markings on the plates would be cleaned off in the scanning process, Grindlay says. From one perspective, if an astronomer of the past drew a circle around an object of interest, cleaning the plate could reveal more stars hiding behind the curve. But the markings are also a record of the scientific process. A 2016 study prompted by DASCH found that many astronomers and historians alike value the annotations on plates and their covers but also believe that photographing or scanning those markings before cleaning them off is sufficient for preservation, unless the plate is particularly important in the history of astronomy. DASCH follows this protocol, photographing all original markings, including on the plate’s “jacket” cover, before cleaning. 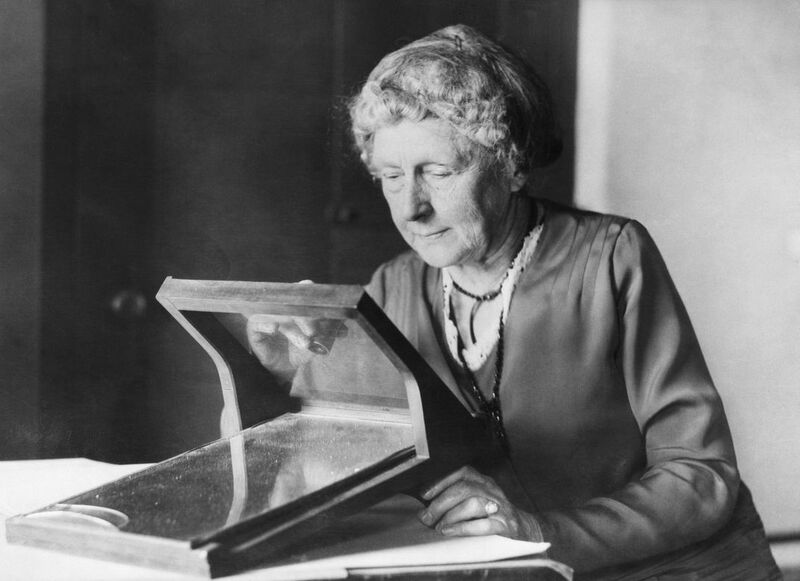 The original annotations are saved on the most valuable plates, such as those made by Henrietta Swan Leavitt, “in deference to historians,” Grindlay says. For Kohne, the plates are akin to works of art. 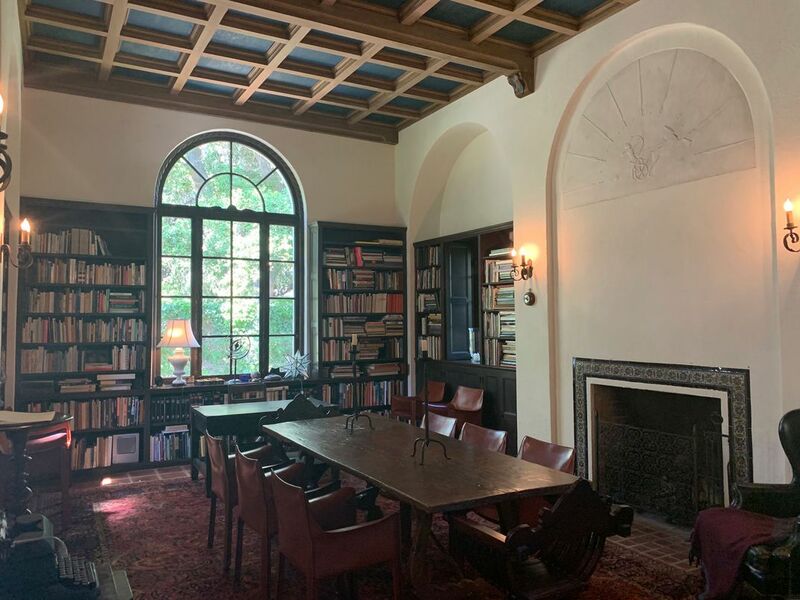 Much of the archives at Pasadena’s Carnegie Observatories office, including the loot from the architect couple’s basement, represent Hale’s “studios,” the way a painting done in Raphael’s workshop by a different artist would be credited to the studio of the famous painter. 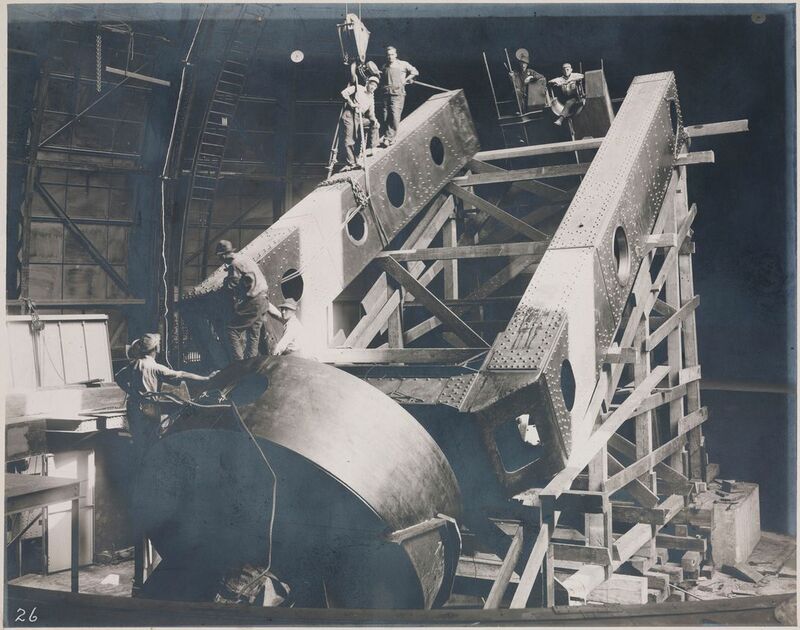 In addition to being scientists, 20th telescope operators were skilled craftspeople. Hale’s iconic Solar Laboratory telescope in Pasadena will not remain dormant. A Mount Wilson volunteer crew is working to aluminize the mirrors so the telescope can clearly project the sun onto a viewing area in the basement. They plan to have local students learn to use the telescope for solar observing, too. Eventually, Moule hopes the team can install a mirror at the bottom of the pit to get the diffraction grating working again, allowing a new generation to examine the sun’s composition as Hale did. On a perfectly sunny Southern California day in March, Mount Wilson volunteer Ken Evans opened the dome to work on its restoration. Evans, Kohne and Moule excitedly talked of viewing sunsets through the telescope and perhaps having a summer solstice party, if the mirrors are ready in time. 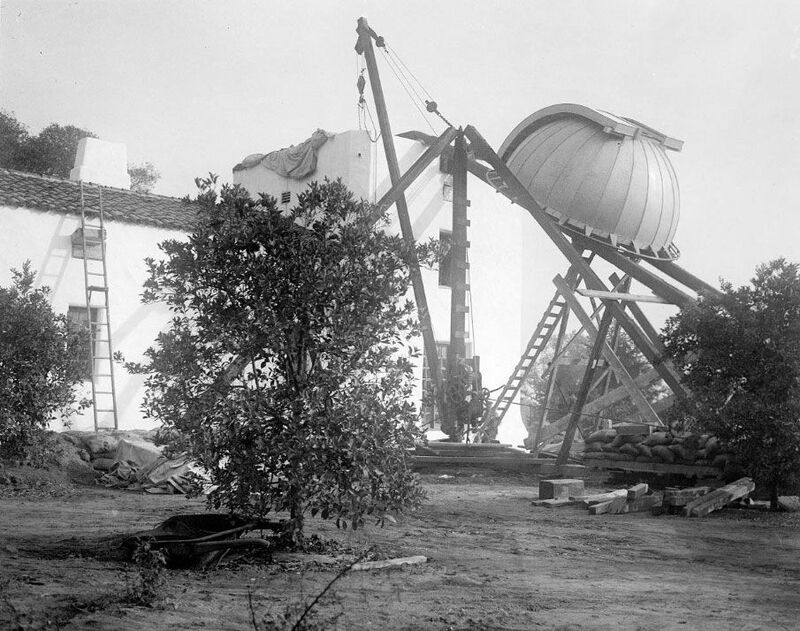 When Evans, a retired engineer, rotated the dome’s slit to face Mount Wilson, the group lamented that a tree blocked the view of Hale’s other temples of astronomy in the distance. This particular lighthouse guards a telescope that once used an instrument plunged almost 80 feet in the darkness to split sunlight from 93 million miles away. And thanks to Mount Wilson volunteers, the sun may soon stream through the cosmic lighthouse once again.